On this page you will find Marcia's original works of art which are currently available for sale. Please check the Purchase Prints page for a list of the Limited Edition Giclée reproductions available. 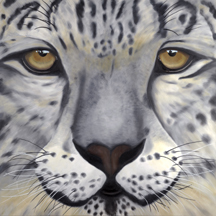 This captivating painting is Marcia's original of the Snow Leopard. It is an oil on canvas measuring 48" X 48" painted on heavy duty canvas with 1.5" thick stretcher bars. Because Marcia paints the edges of the canvas, it is beautiful with or without a frame. 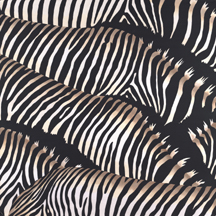 The graphic markings of the zebra's coat have long attracted Marcia. This original painting is 36" X 36" acrylic on heavy duty canvas. With finished edges on the 1.5" thick stretcher bars, this piece is absolutely striking without a frame. Marcia's love for exotic flowers includes all varieties of orchids. This Lady Slipper orchid is a 36" X 36" acrylic on canvas. Painted on heavy duty canvas with 1.5" thick stretcher bars, Marcia also painted the edges making this piece dynamic with or without a frame. When Marcia lived in the Bay Area, there was an area near her home that would fill up with thousands of frogs in the spring. That is when she developed her love for these little creatures though she is particularly drawn to the exotic member of the species. 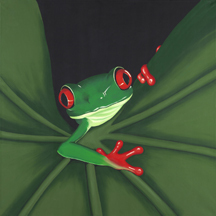 This original is acrylic on 36" X 36" heavy duty canvas with 1.5" thick stretcher bars. As is Marcia's custom, she painted the edges of the canvas making this a dramatic piece with or without a frame. Pictured here on a brown wall, this 36" X 36" original is a combination of acrylic and gold leaf. Simply entitled "Windows," this is one of Marcia's abstract pieces. Painted on heavy duty canvas with 1.5" stretcher bars, the edges are painted making this piece ready for display without a frame although the right frame would very dynamic. One of Marcia's favorite music genres is smooth jazz. This acrylic on canvas grouping depicts a jazz ensemble and consists of seven pieces. Marcia used a combination of canvas sizes and thicknesses to draw more interest to the arrangement. The lead singer is 24" X 36" with 1.5" thick stretcher bars. The trumpet/sax duo is 40" X 30" with 1.5"thick stretcher bars. The band leader's hands is 30" X 15" with .75" stretcher bars. The single trumpet player is 24" X 20" on .75" thick stretcher bars. The single sax player is 18" X 24" on 1.5" thick stretcher bars. The piano keyboard is 18" X 14" on .75" stretcher bars (with interesting tiled border). The backup singer is 12" X 9" on .75" thick stretcher bars. Marcia's fascination for the Southwest began when she was traveling to and subsequently living in Arizona. Chief Joseph is acrylic on textured canvas. This 24" X 48" painting is on .75" stretcher bars and suitable for hanging with or without a frame. This unique piece has a wonderful texture you just want to touch. Marcia stretched burlap over a canvas to create a delightful contrast between the smooth look of the bamboo stalks and the roughness of the burlap. Done on 36" X 36" canvas with 1.5" thick stretcher bars, this piece is excellent to display without a frame as shown here against a tan wall. Inspired by an artist friend from Santa Fe, NM, Marcia created The Garden Party featuring faceless women in their party dresses and hats. Acrylic on unique canvases, these pieces are intended to be displayed without frames. The larger piece is 20" X 26" and the smaller piece is 16" X 20". The Lone Pear is one of Marcia's smaller pieces. This 8" X 10" piece is acrylic on canvas with .75" thick stretcher bars. Shown here against a brown wall, it is designed with painted edges, it can be displayed with or without a frame. Marcia created this 30" X 10" piece with a distinctive crackled finish and aged it to give the appearance of the old masters. It is acrylic on canvas with 1.5" thick stretcher bars. As is typical for Marcia's art, she painted the edges so this can be displayed with or without a frame as it is here on a brown wall. 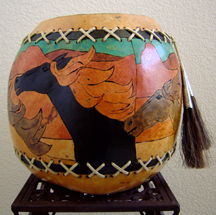 Along with her traditional paintings, Marcia is also a gourd artist. This piece depicts her version of the Wild Mustangs that roam Northern Nevada. It is a mixed media piece incorporating wood burning, leather dyes, acrylic paint, horse hair, tin and leather strips. The piece measures approximately 12" X 12". Marcia created a unique wind chime with this gourd. At approximately 8.5" X 9.5", this gourd combines the use of wood burning, acrylic paint, leather dyes, polished stones, interesting beads, cording and metal wind chimes. This piece was inspired by a beautiful red pear Marcia purchased at her local supermarket. This original acrylic on canvas is 9" X 12" and perfectly suitable to hang with or without framing. Giclée preproductions are not available on this painting. Marcia has created more than 300 pieces of commissioned art in many different styles and techniques. Don't see something in our gallery for your particular needs? Contact Marcia directly to discuss commissioning her for your next valued work of art.